This is a Chinese name; the family name is Gao. Gao Xingjian (born January 4, 1940) is a Chinese émigré novelist, playwright, and critic who in 2000 was awarded the Nobel Prize for Literature “for an oeuvre of universal validity, bitter insights and linguistic ingenuity.” He is also a noted translator (particularly of Samuel Beckett and Eugène Ionesco), screenwriter, stage director, and a celebrated painter. In 1998, Gao was granted French citizenship. Gao's drama is considered to be fundamentally absurdist in nature and avant-garde in his native China. His prose works tend to be less celebrated in China but are highly regarded elsewhere in Europe and the West. Gao's original home town is Taizhou, Jiangsu. Born in Ganzhou, Jiangxi, China in 1940, Gao has been a French citizen since 1998. In 1992 he was awarded the Chevalier de l'Ordre des Arts et des Lettres by the French government. Gao's father was a clerk in the Bank of China, and his mother was a member of the Young Men's Christian Association. His mother was once a playactress of Anti-Japanese Theatre during the Second Sino-Japanese War. Under his mother's influence, Gao enjoyed painting, writing and theatre very much when he was a little boy. During his middle school years, he read lots of literature translated from the West, and he studied sketching, ink and wash painting, oil painting and clay sculpture under the guidance of painter Yun Zongying (simplified Chinese: 郓宗嬴; traditional Chinese: 鄆宗嬴; pinyin: Yùn Zōngyíng). In 1950, his family moved to Nanjing. In 1952, Gao entered the Nanjing Number 10 Middle School (later renamed Jinling High School) which was the Middle School attached to Nanjing University. In 1957 Gao graduated, and, following his mother's advice, chose Beijing Foreign Studies University (BFSU) instead of the Central Academy of Fine Arts, although he was thought to be talented in art. In 1962 Gao graduated from the Department of French, BFSU, and then he worked for the Chinese International Bookstore (中國國際書店). During the 1970s, because of the Down to the Countryside Movement, he went to and stayed in the countryside and did farm labour in Anhui Province. He taught as a Chinese teacher in Gangkou Middle School, Ningguo county, Anhui Province for a short time. In 1975, he was allowed to go back to Beijing and became the group leader of French translation for the magazine China Reconstructs (《中國建設》). In 1977 Gao worked for the Committee of Foreign Relationship, Chinese Association of Writers. In May 1979, he visited Paris with a group of Chinese writers including Ba Jin. In 1980, Gao became a screenwriter and playwright for the Beijing People's Art Theatre. Gao is known as a pioneer of absurdist drama in China, where Signal Alarm (《絕對信號》, 1982) and Bus Stop (《車站》, 1983) were produced during his term as resident playwright at the Beijing People's Art Theatre from 1981 to 1987. Influenced by European theatrical models, it gained him a reputation as an avant-garde writer. His other plays, The Primitive (1985) and The Other Shore (《彼岸》, 1986), all openly criticised the government's state policies. In 1986 Gao was misdiagnosed with lung cancer, and he began a 10-month trek along the Yangtze, which resulted in his novel Soul Mountain (《靈山》). The part-memoir, part-novel, first published in Taipei in 1990 and in English in 2000 by HarperCollins Australia, mixes literary genres and utilizes shifting narrative voices. It has been specially cited by the Swedish Nobel committee as "one of those singular literary creations that seem impossible to compare with anything but themselves." The book details his travels from Sichuan province to the coast, and life among Chinese minorities such as the Qiang, Miao, and Yi peoples on the fringes of Han Chinese civilization. By the late 1980s, Gao had shifted to Bagnolet, a city adjacent to Paris, France. The political Fugitives (1989), which makes reference to the Tiananmen Square protests of 1989, resulted in all his works being banned from performance in China. 1991, in United States (California) Southwestern College, Chula Vista. Translated and Directed by Carla Kirkwood. 1997, in United States (Massachusetts) Smith College, Northampton. Translated and Directed by Carla Kirkwood. Bus Stop (Che zhan). Gao Xingjian. Trans. Carla Kirkwood. Ed. Roger Davies. World Anthology of Drama, London: Longman. 2004. Bus Stop (Che zhan) by Gao Xingjian. Trans. Carla Kirkwood. Modern International Drama Journal. New York. Spring 1995. Q.: What's your comment on Gao's winning Nobel Prize ? Gao's work has led to fierce discussion among Chinese writers, both positive and negative. Many Chinese writers comment that Gao's "Chinoiserie", or translatable works, have opened a new approach for Chinese modern literature to the Swedish Academy, and that his winning the Nobel Prize in its 100th anniversary year is a happy occasion for Chinese literature. Before 2000, a dozen Chinese writers and scholars already predicted Gao's winning the Nobel Prize for Literature, including Hu Yaoheng (Chinese: 胡耀恒) Pan Jun (潘军) as early as 1999. Gao Xingjian's Swedish translator Göran Malmqvist, is a member of the Swedish Academy and was responsible for the translation to Swedish for Nobel Prize consideration. Ten days before the award decision was made public, Gao Xingjian changed his Swedish publisher (from Forum to Atlantis), but Göran Malmqvist has denied leaking information about the award. Gao is the second of the three laureates to give Nobel lecture in Chinese (the other two are Samuel C. C. Ting in 1976 and Mo Yan in 2012). 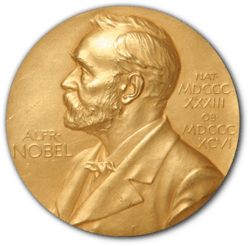 1 2 "The Nobel Prize in Literature 2000". Nobelprize. October 7, 2010. Retrieved October 7, 2010. ↑ "The Nobel Prize for Literature 2000". Nobelprize.org. The Nobel Prize in Literature for 2000 goes to the Chinese writer Gao Xingjian "for an œuvre of universal validity, bitter insights and linguistic ingenuity, which has opened new paths for the Chinese novel and drama". ↑ Lee, Leo Ou-fan (June 2008). "The happy exile". Muse Magazine (17): 93. Wikimedia Commons has media related to Gao Xingjian. "Gao Xingjian collected news and commentary". The New York Times. "The Challenge to the 'Official Discourse' in Gao Xingjian's Early Fiction" by Deborah Sauviat. First-class Honours thesis. University of Sydney, 1996. Gao Xingjian and "Soul Mountain: Ambivalent Storytelling, Robert Nagle, Houston, Texas, 2002.